HAVE YOU EVER perused the specialist CD store shelves (a rare pleasure these days, I know) and eschewed the solo or duo releases in favour of something seemingly bigger, bolder and multi-layered? If so, you might run the risk of missing out on the likes of Finnish treasure It Takes Two to Tango. As part of ACT Music’s expanding Duo Art* series, saxophonist Jukko Perka and pianist Iiro Rantala recorded, across just two consecutive days, this no-hiding-place duo performance which demonstrates their affinity with the Finnish tradition of tango, as well as their richly empathetic, improvisatory qualities. Making expansive and particularly sonorous use of the renowned Alfred Brendel Steinway d-524780 (which the great virtuoso played during his concert appearances at Berlin’s Philharmonie), Rantala clearly revels in this thirteen-track musical conversation with ace saxophonist Perko. Based around themes of love, it’s not all about the tango – indeed, for a programme so wide-ranging (from Charles Aznavour to Jean Sibelius), it holds together beautifully, requiring close attention to enjoy its depth of detail. Perko’s agitated arrangement of traditional melody My Sweetheart is Beautiful (Minun Kultani Kaunis On) is taken far from its traditional Finnish roots, resounding to his slippery alto and Rantala’s spirited rhythms; and Jacob Gade’s showy tango, Jealousy, oozes passion in a particularly lively outing. The clear communication between Perko and Rantala is tangible in their creative reading of Just Say I Love Her as they subtly deconstruct its achingly beautiful melody, followed by the sighing soprano sax solace of Charles Aznavour’s For Mama, gorgeously underpinned by Rantala’s strong-yet-subtle assurance. The quizzical tango buoyancy of another Finnish folk tune arrangement, Therefore I Am Sad, is reminiscent of the Ballamy/Carstensen album The Little Radio, Perko’s wonderfully drowsy alto easing over signature chordal ripples from Rantala, whilst Romance rises with the anthemic lyricism and confidence of Tim Garland. And traditional Swedish tune A Blessing (Lyckönskan) resonates to muted bottom-end Steinway strings, this most ravishing of melodies bearing all the quiet nobility of Abdullah Ibrahim’s The Wedding. Jukka Perko’s own I Will tenderly rises and falls, its unfailingly amiable soprano tune giving way to Rantala’s lucid piano soloing; and Victor Young’s classic Stella by Starlight is given a resolute, smouldering tango twist, the duo’s dynamic sensitivity carefully balanced. Of Russian origin, Love Is So Beautiful is delicately pitched, with Perko’s alto taking on a Getzian mellowness and vibrato, as it also does in Finnish-titled Good Intentions – carefree yet with pangs of disquiet. To close, Sibelius’s familiar hymn from symphonic poem Finlandia is explored in both piano solo and duet versions: redolent of a Keith Emerson transcription of Copland or Ginastera, Rantala’s take on it grooves heavily to deep-end piano oscillations; and, in contrast, the duet variation twinkles to emotive high soprano exploration and solid piano grandeur. My admittedly cursory first listen was a brief mistake, for the exquisite clarity and musicality later revealed in this recording now call me back again and again. Released on 11 May 2015, further information and audio clips can be found at ACT Music. 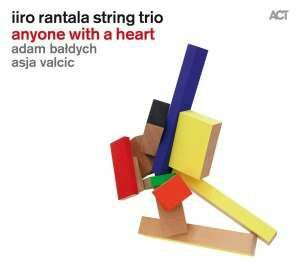 THE CLASSICAL FORM of piano trio is unfamiliar in jazz spheres – but, for Finnish pianist/composer Iiro Rantala, Polish violinist Adam Baldych and Austrian cellist Asja Valcic (all classically trained), it seems the perfect grouping to animate these jazz originals from Rantala. The compositional approach stems from a desire to champion melodies – as Rantala says: “…in today’s jazz, most people try to get by without them… and if they don’t, they play standards.” And much of the sequence is tightly arranged in three parts, beautifully balanced with the freedom to improvise, frequently sailing close to ‘light music’. But it also has a depth of integrity which is both charming and inviting, due in part to the multifarious timbres the ‘string trio’ members achieve between them, as well as their undoubted shared discipline and musicianship. The music feels close and personal, conveying a variety of emotions – from heart-rending romanticism, through gritty chasing momentum or devotional simplicity, to unalloyed and overflowing joy. Iiro Rantala’s pianistic style is noteable for its precision and clarity, but also for its ‘prepared/muted’ technique which complements the strings of violin and cello, used to great effect in Freedom (at times, its bounciness mimics a synthesised approach reminiscent of Vangelis). In contrast, there are echoes of Asja Valcic’s own Radio String Quartet Vienna in the pulsating Hard Score, driven by cello and violin, Rantala’s piano running with the heightened intensity and contributing muted bass, whilst the gypsy-jazz violin is phenomenal both in raciness and fluidity. A Gift is easy-going and entirely accessible, Baldych’s agile plucked melody preceding a lush, homely trio arrangement which glistens with top-end piano runs; and the delicate musical box introduction to Prayer builds into an impassioned love song, with the individual violin and cello melodies so yearningly lyrical. Title track Anyone With A Heart expresses all the warm affection of a Sunday evening’s soft TV drama, its bright, memorable melodies evoking rolling Yorkshire Dales landscapes or stately country houses. And, just as irresistible, is A Little Jazz Tune which, as its name implies, provides a jaunty ‘life’s good’ interlude with Grappelli-style portamento fiddle improvisations over Rantala’s unashamedly cheerful piano. Alone switches to a minor key of sorrowful longing, Valcic’s cello singing so eloquently and movingly; and Rantala’s brief, gentle arrangement of Harold Arlen’s Somewhere Over The Rainbow offers the subtlest of silver linings, before heading into the convivial, showy curtain call, er… Happy Hippo! Those looking for hard-edged, challenging jazz are likely to find this release a touch too light. But it exudes a warmth and a sincerity which is difficult to ignore, such is the charm and openness of Iiro Rantala’s writing and the conviction of his players. It’s certainly been a popular choice in this household. ‘Anyone With A Heart’ is released in the UK on 10 March 2014, by ACT Music – audio samples and information available here.